Graduated from Kuwasawa Design School, and Waseda University. Founded PAOS in 1968 and continued to pursue research and practice on the theme of the establishment of design theories for management and the development of application-oriented design methodologies. PAOS has worked with some 100 corporations representing Japan on CI branding and business strategy design, establishing a long track record of success and producing numerous hallmark case studies in the process. About 100 corporations, including NTT, INAX, Bridgestone, KENWOOD, Benesse, Nissan and others. Published many books about corporate identity including “Design Policy : Corporate Image Formation”, “DECOMAS – Design Coordination as a Management Strategy”. From 1998 to 2000, He worked as a chairman of the G Mark (Good Design Award) and helped guide the privatization of the organization. From 2010 to 2018, Course Director of STRAMD (Strategic Management Design) Tokyo and Osaka. In 2015, Tokyo 2020 Emblems Selection Committee. 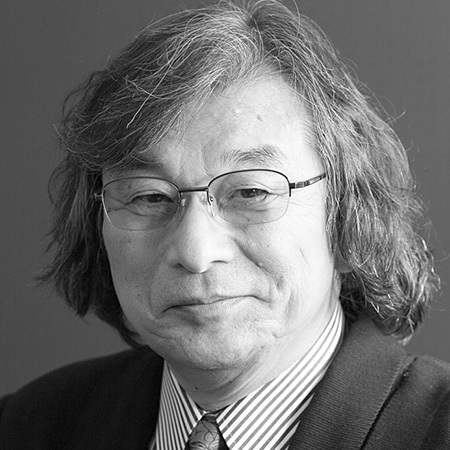 Director of the Japan Graphic Designers Association (JAGDA), many others. Mainichi Design Award, Japan Sign Design Association Award Grand Prix, The 1st Katsumi Masaru (father of Japanese Design) Memorial Award, The 1st Kuwasawa “Design of the Year” Award, many others.